Complete sets of maundy money (4d, 3d, 2d, 1d) did not come about until the year 1800. It was from 1822 that sets were distributed solely for use in the maundy ceremonies. The first time that "coins" only were given out at the maundy ceremony was at the start of Queen Victoria's reign on the 12th April 1838. Until 1909 maundy sets could be purchased through the banks by the general public. Edward VII stopped this happening as he felt this reduced the value of the coins to the recipients. Mintage numbers from 1909 onwards reduced substantially. No more than 2000 sets have been struck in any one year since then. In 2002 for example there were 1,678 sets issued. In 1932 the monarch King George V distributed the coins personally at the maundy ceremony. This was the first time that this had happened since the 17th century. In 1920 the silver content of the maundy coins was reduced from 0.925 to 0.5000. The coins reverted back again to 0.925 silver from 1947. In the latter part of King George V reign green and white purses were introduced (with short strings) for distributing maundy coins in. This tradition lasted until 1979 when the short string purses were withdrawn. For centuries the maundy service was held in London. Westminster Abbey had held the service for some 60 years. Nowdays it is held in a different city each year. Maundy money is now distributed to recipients in a small white leather bag (actual size 7cm x 10cm) with a green leather drawstring. The coins are sealed in individual plastic envelopes to stop scratching. 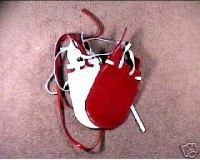 Since 1979 a small red bag (again 7cm x 10cm) with white drawstrings is also given to the recipients. This additionally contains a £5 note and a fifty pence piece in place of clothing and other provisions given in earlier times. Most recipients these days are selected for their service to the church and community. Ages are always checked to ensure they are pensioners. By tradition their incomes are usually modest.